I am sure that most of you are knee-deep in Thanksgiving lists and travel coordination this week, so I’m going to keep this giveaway post short and sweet. Thanks to Ashley English and the kind folks at Lark Crafts, I have one set of Ashley’s Homemade Living books to give away. 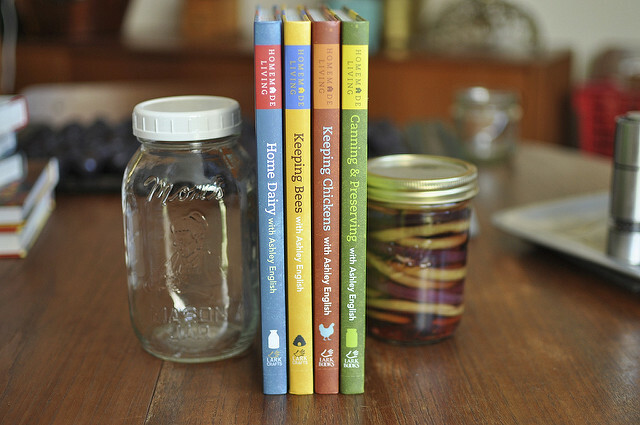 This series includes Canning & Preserving , Home Dairy , Keeping Bees , Keeping Chickens . These books are the perfect resource for those folks who want to delve deeper into an array of homestead-y arts. If you’re limited by space (like me) and can only dream about having property enough for a flock of chickens or a personal beehive, they also make excellent aspirational reading. Because Thanksgiving is nearly upon us, let’s focus on gratitude in the comments. I’ll go first. This year, I am exceedingly grateful for my family. I am deeply grateful for the amount of love in my life. And I am outrageously grateful for all of you who take the time to read these blog posts and make my recipes. Giant thanks to you all. And now, in more organized fashion, the giveaway instructions. Leave a comment on this post and share something for which you are grateful. Comments will close at 11:59 pm east coast time on Saturday, November 30, 2013. Winner will be chosen at random and will be posted to the blog on Sunday. Giveaway is open to US residents (apologies to my more far-flung readers). One comment per person, please. Entries must be left via the comment form on the blog at the bottom of this post. I do not accept submissions via email. Disclosure: The nice people at Lark Crafts are providing the books for this giveaway. My opinions remain my own and I received no compensation for this post. It’s here because I like Ashley and her work. I’m thankful for my wife, the child who will soon be in our home, and the chance to win books. I am grateful I get to spend the week with my niece and nephew!! I am grateful for my mom, who has always been my rock and my strongest supporter. I’m grateful for my big, beautiful house in the country and the amazing people that fill it. I’m practicing early gratitude for a good buyer for our cute, little city house who will find us soon! I am grateful for the entire weekend off and time to see a movie with my baby sister! This is awesome. I love canning and learning more for my family. I’m grateful for my husband and our two daughters, and the lovely 1850 house we all just moved into! I’m so grateful for my goats!! And my chickens, for providing us with all the delicious food products they do. I feel like I already know most of the things in this book but I get questions all the time and I’d love to gift them to people who are interested in these specific things. Or keep them all to myself and just lend them out. I am thankful that my family has a roof over their heads, clothes on their backs, and a huge Thanksgiving feast to enjoy on Thursday!! to enjoy thanksgiving with my parents. I’m grateful that my sister gets to come visit for the holiday! I am grateful for wonderful friends to spend the holiday weekend with and for the delicious homemade food we’ll all be wallowing in! I am grateful for my wonderful happy baby! I am thankful for my wonderful family! They are simply the best! I am greatfull for my family! So thankful for healthy children who are growing so fast! I am grateful to be able to feed my family all of the wonderful food we’ve grown and preserved together. I’m grateful that my lovely grandparents were able to officiate my wedding to my very favorite person. Im thankful for a heated home! It’s been veru cold this week. I am thankful for my Lord and Savior Jesus Christ and the family that he has given me! I am very grateful for my family!! I am thankful for my family, my dogs, my cat, and my Chickens! Very blessed to live the country life and would love to learn more about how to do that. These books look like a very good read. I am thankful to see another holiday, period. I’m greatfull for family and friends and enough to share with others. I am grateful for the beautiful place that I live, the kind people who fill my life, and the healthy body I get to live in. I am thankful to be alive, to have people in my life who understand and love me no matter what and for the ability to have eyes to be able to read these books when I win them !!! Happy Thanksgiving everyone – enjoy all the love that surrounds you ! I am grateful for my friends and family. Truly. Support systems through the good and bad are priceless and incredible. Ooooh I love Ashley’s blog!!!! I am thankful that I have the skills and the money to practice canning, preserving, knitting, soaping, candle-making and all the other hobbies that keep my family and friends happy and well-taken-care of. So many things to be grateful for. My sweet husband who is SO supportive of my vision disability, yet doesn’t push in beyond what I need. For my son, whom I wanted so badly and now 20 years later am SO very proud of. For my extended family who love and support me so very much and for my sweet wonderful animals who provide unconditional love all the time. I just couldn’t get any better. I am grateful for have 3 of the 4 children home for this holiday. I am grateful for health, loved ones, and feeling connected to so many, in so many ways! Thanks Marisa! I’m thankful for my family who has given me a lot of support, especially recently as I transition into life as a full time grad student. So thankful to live on a farm !! Sure could put these books to good use !! I am grateful for my mom for continuing to host Thanksgiving! She makes a wonderful turkey and provides a warm environment where we can share it with friends and family. I’m so glad I don’t (yet) have that responsibility. I am grateful for Forgiveness; being able to forgive a family member for a long-standing hurt has freed me in unexpected ways and allowed our relationship to blossom. I’m grateful for all the blessings in my life – my health, my family & living in a place that allows me to do pretty much whatever I dream of! I am thankful for my four kids and Prince Charming. Happy Thanksgiving! I’m grateful for all the wonderful local farmers, their gardens and their livestock for filling my table this Thanksgiving and year round – and to their happy animals who have only one bad day in their lives. I’m grateful for the health of those I love. We have purchased our first house (finally) and now I am trying to do some “homesteading” for ourselves. I am in the very early stages and would love to learn more. I am so grateful this year for my quiet home near the woods. It feeds my soul. Happy Thanksgiving! I’m so thankful for more than I can write here, but first of all to God, who has provided for us and continues to bless us. The books would be a wonderful gift, as I prepare all our food and can/freeze all I can. It’s so good to have real books that you can read anywhere you are. Am hoping we can get chickens next year. Thank you for offering these and Happy Thanksgiving, everyone. I am thankful for my hard-working husband and our four sweet, wild, loud, lovable, huggable boys. I am grateful for my wife, for our furry and feathered family, for our home, and for all the love we share and receive. I am grateful for everything I own and everyone who is in my life. I have been very blessed with family, health, and happiness! Some of these things are taken for granted and shouldn’t be. I would love to win these wonderful books. Thanks so much for the opportunity. I am grateful for everything that I have been blessed with in my life. My wonderful husband, my creative and imaginative stepson and our sweet little bun in the oven! We have also recently been blessed with land to cultivate and begin our self sustaining journey. It is still in the ‘clearing to make room for veggies, fruits, bees, etc.’ stage, but we are excited to begin our journey to a healthier, self sustained life. I am thankful for my husband and children, and most of all, for Jesus. I am thankful for my family and that I am back living in the same state as most of them. I am grateful for the time I will get to spend with my kids this weekend. I am thankful for my family, and for the time they allow me to can my goodies! I’m grateful for the little luxuries I have that so many people in this world will never enjoy- a roof over my head, sleep without fear, running water, food in my belly, and the time to consider homesteading for economic benefit and independence rather than survival. I am so grateful for my health and my family. I am thankful for my family, a job that I love, and I am thankful for all of the helpful tips I have received online for my new found hobby of canning. I’m grateful for my beloved wife. im grateful i have a large 5th wheel to live in. im grateful i still have family. im grateful my hens give me eggs when they feel like it. I am so incredibly grateful for my family. We lost my father this year, and having my family around me has been marvelous. I am ever so grateful that my own Modern Family incorporates six children from three marriages, sons-in-law, and grandchildren. I’m grateful for my health, and the experience last year that showed me what not having health is like. I’m grateful for a funny, silly, wonderful little family! I am thankful for my wonderful family. I have 2 daughters that are just the best, 4 absolutely wonderful grandchildren and the best husband in the world. I am just a lucky woman. And I really do appreciate them. I am grateful for amazing authors like Ashley. I am so very grateful for my husband, who would not hesitate to give his life for me or my children if need be. He’s been the absolute and unwavering rock of our family. I’m grateful that my children grew up to be the decent, hard working people they are today, due in large part because of the things my husband took the time to teach them while they grew. I’m very grateful that they have chosen wonderful spouses who are in it for the long haul. I’m grateful for my amazingly wonderful grandchildren, who are showing me how to see the wonder and beauty in this world through their eyes, thus letting me have a happy childhood, after all! I’m grateful that I have everything I need to get by, and then some. We live on a fixed income which isn’t very big, but compared to 2/3 of the world’s people, we are incredibly, unimaginably wealthy. I’m thankful that I live in a place where the neighbors don’t mind if I start raising chickens, and that the flowers and trees in my yard have overgrown the fence. I’m very thankful that I have a little space to grow food for my family that I can call my very own. Gosh, I could go on all day about the things I’m glad for, however, if it all disappeared tomorrow I’d still be alright, as long as my family is okay and healthy. That’s the thing I am most grateful for, after all is said and done. As long as my family is okay I am the wealthiest woman alive, and the rest, while I’m grateful to have it, is just gravy! I’m also grateful for people who like to share important knowledge through book give-aways! Thinking of starting a bee hive, and could use all the knowledge I can get. Thank you! Having several friends and family members in stage four cancer, and several more who just kicked stage 1 in the rear, I’m really grateful for every breath. Thankful for still being “here” after being hit by a bus in london, and thankful that my wife has recovered from her BC diagnosis. Thankful for our children, and that our family is healthy again! I am grateful to have family that can visit, even though far away to see everyday! I am thankful for my sons. I’m grateful to be home with my family this week. Much needed time at home in my kitchen. I’m grateful for family and the love that binds us together, even in the hard times. I am thankful that I actually thought ahead this year and have already started cooking for Thursday. Hopefully, this will give me time to spend with my guests rather than frantic in the kitchen! I am grateful everyday for my amazing husband. Earlier this year he got a new job and gave me the opportunity to leave mine. I have spent every day since enjoying time with him, my friends and family. I am grateful that I live in a place where nobody cares if I have chickens or a big garden or even if I had a cow. And it’s a pretty place to live, too! I am thankful the kids being on vacation during the holidays so we can spend some quality time together. I am thankful that my children are at the ages (7 and 9) where they can begin to identify what it means to be grateful for the things that they have. They are beginning to recognize that others may not be as lucky. I’m a cliche but what can I say; I’m thankful for my family. I’m thankful for my Family, they are the greatest treasure I could ever have. I am grateful for all the privileges of which I have little or no control: health, safety, job, health insurance, kids, supportive partner…blessed be. I am grateful for aspirational reading, which is sometimes just that, but other times inspires me to make wonderful things. I am so thankful for a warm home during our first winter storm this year! I am grateful that I have finally found a job I enjoy to come to everyday where I am appreciated for all that I do. I am thankful for my family, health and time to be able to share with everyone. This year, I am grateful for a daughter who loves to laugh, a son who loves to serve, a wife who loves to give, and the chance I have to learn form their examples. Thankful for my family and all that we are blessed with. I love your site. I work at a grocery store in the Pacific Northwest, a job for which I am so grateful to have. Around canning season I get to talk to folks about what they are canning and I get a chance to talk your site up AND refer folks to our little book section that has your book in it! An attitude of gratitude is my life motto – today I esp grateful for my husband – a dream come true! I am thankful that the Lord has given me this life to live. Thankful for knowledge and blogs that enlighten! I am thankful that my husband is back in the USA after serving a year in Afghanistan. We will not get to see him for a while yet but I am grateful that he is safe and we can talk on the phone in the same time zone. As a new canner who is starting a hive in the spring, this set would be awesome! I am thankful for the skills that I have gained in preserving food. I can put good, nutritious things into my kids and myself. Very thankful for my health this year. Feels as if I’ve been through the wringer physically lately, but I keep reminding myself, it could always be worse. I am thankful for a healthy family , a good job And a roof over our heads! I am grateful for my health this year. I am grateful for giving myself more time for self care and friends, and for open minds, local farms, and all my many teachers. I’m grateful for friends and family, and future plans. I am thankful for everything i have been blessed with. I am blessed with a wonderful, healthy family. I’m grateful (SO grateful) for my health. I am grateful for my warm, safe home. I’m grateful to have wonderful resources to learn more about the activities I enjoy. I am grateful for tomato jam…my absolute most favorite new recipe in 5+ years of canning. I am so incredibly thankful for friends who treat me like family, and for my family whom, despite being far away, is still a wonderful source of support. I love Ashley’s books! I am grateful for food to eat, a roof to live under, and a wonderful human being as well as two furry children to share this wonderful ride called life with. Have a wonderful Thanksgiving! My family, especially my parents and my husband! They are amazing and always so supportive! I’m grateful for health, great family and friends. Thankful for family, friends, and everyone else I know!!!!!! I’m thankful for support and love from my friends. Couldn’t make it through without ’em. I’m thankful for my family, and for health and happiness and the ability to be optimistic. I am grateful for this beautiful world in which we live, for the songs of the birds and the roaring sound of the ocean. I am so thankful for the happiness I have experienced in my lifetime. I am indeed a blessed individual! I am so very grateful for my smart, beautiful daughter. I am thankful for my home, food, friends and family. I’m grateful that my family and I, despite a year of colds and stomach viruses, are in pretty good health. Not everyone is going into the new year so lucky. I am thankful for my family, and grand kids! I am thankful for my son. My world was full of darkness. I lived a life in the shadows of pain, suffering, and anger… My son is my light. He’s perfect and beautiful and amazing. I’m thankful for him. I am thankful to have my wonderful husband who works so hard to provide our family with the lifestyle we have chosen. Thankful for Pear Vanilla Jam! And all the other jars of goodness lining my pantry shelves. I am thankful for my son and husband. This Thanksgiving I am so thankful for my husband. He is the nicest, kindest person I know. He is always thinking of ways to make me happy. He even helps me make applesauce! We canned 21 quarts a few weeks ago. I would love to get these books! Thank you for your blog. Happy Thanksgiving! Always thankful for my family and dear friends, our good health and happiness. Also very thankful when I win free things on the internet. Happy Thanksgiving! Thankful for health & happiness. I am thankful for my job. I teach kids who have emotional and/or behavioral disabilities. Most people can’t see my students past their behaviors. They write them off. I get to see them for who they are, and see them light up. Most people miss out on the incredible people these young men and women are. But I get to see it every day. I’m so grateful for my partner. He is truly wonderful and supporting. I’m happy we live in the city where his father’s family is from so we can spend quality time with his grandmother before it’s too late. I’m grateful for the freedom and creativity canning has given me – it’s been a tranformative learning experience. I’m grateful that as each season passes, my partner and I are becoming more and more environmentally conscious, and we’re getting closer to our goal of living off the land. I am grateful that I have a rolling chair in the kitchen. I have four more weeks on crutches. I’m grateful for my health, and for my family’s health. I am thankful for my partner, Katy, who planned an amazing Thanksgiving vacation which starts….NOW! I am grateful, so very grateful for my dear husband. Without him I would not be where I am today. I am thankful for another year – the good and the bad. I am especially thankful for the small clan we have created. Love begets love. Each new generation amazes the last. The new learns from the old. And life goes on. I am thankful that I have my health again after 5 straight years of surgeries and being sick. I haven’t set foot in a hospital in 3 years and I am hoping it stays that way!! I’m thankful for a brand new nephew to kiss on this year! I am thankful for my beautiful family and for everyone that has helped me grow and learn since having my daughter almost 2 years ago. I’ve tried some of Ashley’s jam recipes, and, well, bees and chickens are on my maybe soon list. grateful and glad to have people around me who make me laugh and make my life better. My parents and my in-laws who have traveled to help with kids, jobs, and the house. Very lucky to love AND like them all. I am grateful for the love and support of friends, for the opportunity to live and grow, and for all of the wonderful advice, tips, and encouragement for healthy living on the internet. I am thankful for my child and health. I am grateful for Thanksgiving and the chance to be grateful together. I am grateful for my soul that sometimes overrides the head and will and chooses the best route to grow and learn. Grateful for the homegrown turkey we will be providing for thanksgiving dinner! So grateful to have reached a point in life where I am content. Thankful for our new baby girl! So thankful for my boyfriend! While I’ve been making a career transition this past year he has been so supportive, both emotionally and financially. He makes my life a little bit easier every day! I’m quite simply grateful for my life. Everything, everyone in it. I’m grateful that someone told me I should consider being a teacher, because I’m currently a student teacher, and it’s the best! I am grateful to be a two time cancer survivor and celebrate another Thanksgiving with myy family. I am grateful that I was invited over to someone else’s house for Thanksgiving! I am thankful for my husband, who happens to be my #1 supporter. I’m thankful for the ting of lids sealing. I’m thankful for the smell of bubbling soup. I’m thankful for rain on the tin roof and not too many drip-drips on the floor. I’m thankful for my dad, who shot the turkey, for mom who spins a thread for her pecan pie instead of using corn syrup, for my husband who actually knows how to carve a bird. I’m thankful for my tiny urchin, who is gluing turkey hats for 11 people to wear around the table. I’m thankful for the vegetarian friend who gets to eat everything except the turkey, and also thankful because the celiac friend isn’t coming this year, because vegetarian AND gluten free nearly drove me to the bottle by breakfast last year. I am grateful for my parents, who are elderly and failing. Each day with them is a gift. I am grateful for for my healthy family. I’m grateful my husband and two little boys, and for this new home, and the land that it sits upon, that we can turn into our family homestead. 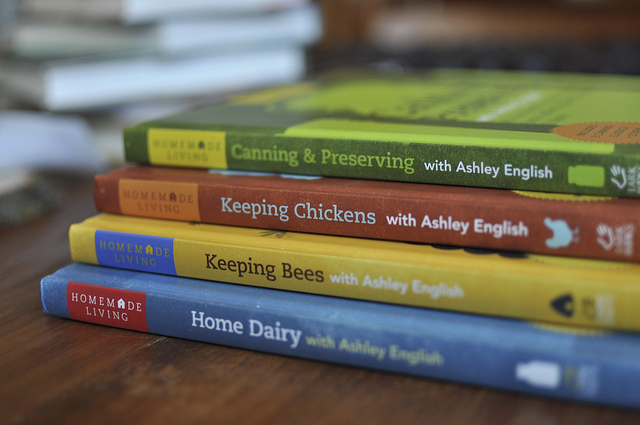 I’ve had these books on my amazon wish-list for a while now – I’m especially excited about “Keeping Chickens,’ as we’re planning to start keeping chickens next spring. i am so grateful for my partner, who has cleared off several shelves to allow me to have both a jam cupboard and a pickle cupboard! I am thankful for my friends, who are a family to me. Alway therewhen I need them. This year I am most grateful that I have found the love of my life and that she married me in October. I am thankful for new family members: addition of a great niece, Avery, and nephew, Austin and upcoming nephew in Feb. Nothing is better than sharing holidays with kids and teaching them about what they mean to our family! I’m so grateful for my family & friends. I am thankful for good health. I’m thankful for my awesome husband! I am grateful for my job cooking in a nursing home. Not only do I get to cook for others, which I love, but I love the residents too. I’m thankful for my Knitting Group. I’ve never been part of such a welcoming, wonderful group of women! I am thankful that my Mom and Dad cared enough to teach me to cook and to can! I’m grateful for the adventure I get to have with my husband as we settle in to a new life in the northwest. I’m grateful for the friends we left behind and the new friends we’ll make here. And I’m grateful to be close enough to have my family join us for thanksgiving. I am thankful for an easy pregnancy. With all the terrible things people say, it’s been pretty easy so far. I am very thankful for my family and for my faith. Both things get me through life and make me strong. I am thankful for my husband and his endless help and support. I am also so thankful we found our own property where we are able to garden and hopefully one day soon have chickens, bees and cattle. I am very grateful for my family and our new friends in our new city and our older friends who are still there for us. I am grateful for many of the people and things you all mention…but above all for the breath of life to enjoy it all! God bless and happy turkey to you all! Grateful that the Thanksgiving food frenzy will be over soon! Among many other things, I’m thankful for seven old rat terriers who have agreed to share their life and love with me each and every day. When life is spinning off in all directions, they (with seven different, unknown stories) are forever by and on my side. I am grateful for my friends successful bone marrow transplant. Of course my family–four kids, their spouses and our 11 grandchildren. As I prepare to host them all at Thanksgiving, I’ve particularly been grateful for my Mom’s dining room table. It’s what I chose after she died. We shared many happy family meals around that table and I want to continue that in my own home. I am grateful for grace. Thankful for this wonderful ride that is life. It may not always be perfect but I’m happy I’m here to live it fully. I’m thankful for a good life. I’m grateful for my family. It sounds cliche, but I’ve had a hard last few months and they’ve really been there for me. I am grateful for the opportunity to celebrate Thanksgivakah with my multi devotional family. We will be combining Christian traditions with Jewish traditions for a truly unique holiday. I’m extra grateful for my family this year, being so helpful over the last year since my daughter was born. I am thankful that each day I get to enjoy and love my family. Oh. And coffee. I am grateful for my 2 wonderful cats, having time to enjoy creative tasks, and for all the improvements that have come into my life in the past year. I am ever so grateful for a kind and understanding husband. The holidays can bring out the crazy with the extended families, and he handles it all with grace and is so good to me when I am at my most frustrated! I am so grateful for my beautiful, kind daughters and my generous community. I’m grateful for the overwhelming support and help of my family. I’m so thankful for new beginnings every day. I am thankful for the farmers in my community who produce much of the good food my husband and I eat. I am grateful that my family and friends are willing to taste test my kitchen creations, no matter how bizarre they think they are. I am thankful for my family & for freedom. We bought a farm & are learning as we go. Its hard but wonderful at the same time. I love to garden & love animals. I am thankful for my family & for freedom. We bought a farm & are learning as we go. It is hard but satisfying. I love gardening & animals. I’m thankful for my doggies who always put a smile on my face! I am thankful for all of the new opportunities that have arisen this year! I am grateful for having work that I enjoy (most of the time). In this day, it’s a big thing. One of these days I might win one of your contests. Would LOVE anything you give away. I’m thankful for my wonderful community. i’m thankful for my dog. She sleeps next to me now that I’m sick instead of at my feet like usual. They look like wonderful books and what a great addition these would be to add to anyone’s library. Most thankful for having Christ into my life; family and friends and last but not least; even tho I don’t have a blog myself, I’m thankful for all the bloggers out there. I am grateful to live in the USA; its not perfect but it suits me perfectly! I’m so grateful for my health. If it weren’t for good health, I wouldn’t be able to enjoy my family, our world, or this adventure called life in quite the same way. Happy Thanksgiving! Most thankful for my Lord, Jesus. And my family! My beautiful daughters, family, wonderful friends and soul sisters. With them I can endure anything. I am grateful for everything in my life and the man who makes it all possible. Sorry everybody but I have the best hubby! I’m grateful for my children’s birth mom. I wouldn’t have my children if it wasn’t for her gift of love. I am grateful for my health and my lovely husband, with whom the impossible becomes possible. Thankful for a wonderful husband. I happy to be here. I’m thankful that pursuing things like chickens and dairy can be a luxury for me, however much enjoyed, rather than an extreme necessity. I am thankful for God in my life, my family and friends, and good food. Oh so very grateful for the home I’m resting in right now. In the company of a dear friend and her children. I am grateful that my family made it through one of the toughest year’s of our life. I’m thankful to be surrounded by amazing people, and for my family, and for the love I see in the world every day. So much to be grateful for, but for this post, I’d like to share my gratitude for Ashley and her Keeping Chickens book. About a year ago, we made a coop and purchased four baby chicks and it has been an amazing experience for the whole family. It wouldn’t have happened without reading her book. I have looked at these books on her site before and thought about buying them. It would be exciting to win them!! I’m thankful for a wonderful family that I learn to appreciate more each year that I get older. And thankful for the simplicity of life. I was away traveling for a year so I am thankful I am back to spend Thanksgiving with my family! I am grateful for my family and friends and especially my husband. I’m thankful for a husband who’s still my best friend after 10 years of marriage. I am grateful for family as they are always there no matter what to comfort, laugh with and help you when you need it most. I am grateful for all the wonderful blessings in my life, and mindful that all who deserve them don’t have them. I’m thankful that i get to spend Thanksgiving with my family, which I haven’t been able to do in about 5 years! My Gratitude list is so enormous I could not list even a small part here. Today I am thankful for the bounty of gifts that nature has given, and the honor of being able to preserve those delights and have them in my larder. I have had 60 years of life that has brought me joy and tears. I am so happy to see that the home arts have not died out, and is being fostered by folks such as you and Ms. English. My mother taught me to sew, my Mother in Law taught me to can, freeze and dehydrate. I am still learning, as my interest in this blog proves! Hats of to you, Marisa, for fostering this! I’m thankful to have my family with me for the holidays. My home and having my entire family in it. Another day, another chance; giving thanks for a good day and grace to make a lousy one better. I am soooooo grateful for my wonderful husband who is the best father! He is always there for me and our children. I’m grateful that I have a warm house as the snow is falling thick and fast here! I’m thankful for God, my family and our home! My husband and I consider ourselves homesteaders, so these books would be a wonderful addition to our reference library :). My family and that I have a job and a roof over my head. I am so grateful for my friends and family! I am thankful that I am neither rich, nor in need. What God has supplied is just enough. I am thankful for the lessons in hard work taught to me by my parents. For I am not afraid to spend hours gardening, canning, freezing and dehydrating food that is grown under my watchful eye. I am thankful for my health and my children! I am thankful for my husband who provides constant support and a good critical eye when I need it. I am thankful for my boyfriend, family, and friends, with whom I get to share this awesome life. I have so darn much to be thankful for. But in this case, I’ll just say I’m thankful that I learned that sauerkraut is so easy to make at home. I am grateful that my daughter likes Dr. Who and sings John Prine songs in the morning. Besides the usual family and friends stuff, I’m thankful to have a husband who supports my desire to grow and preserve food, and raise chickens. He’s willing (even happy) to live with less spending and less stuff than his co-workers in order to make our dreams happen. I am grateful that we are having sunny, snow-free weather for this Thanksgiving weekend. I’m grateful for the many blessings in my life. I have a loving family, a nice home, a good job and more than enough to provide for my children. I am also grateful that I have learned how to feed my family nutritious food that I can make myself and Marissa has been a big part of my learning, so thank you Marissa – I am grateful for you! I am grateful for the beauty of nature – wide open spaces that please the eyes and soothe the soul. Thankful for my great family! I am thankful to have all of the kids home, safe and sound, for the holiday! I am thankful for my friends. My family suffered a minor tragedy recently and I was really touched by the support they provided. It goes without saying that I am thankful for the love of my husband, children and close-knit family. But I am also grateful for Google, white wine and chocolate. I try to lead a grateful life, conscious of all the good that enters it. And, there is a bounty of good in it. I appreciate the people in my life most of all, I appreciate having a job that I enjoy and make a difference in, I am grateful for my health and that of my loved ones, I love my pets. I am grateful for the where-with-all to enjoy a comfortable home, good food and entertainment. There are thousands of smaller gratitudes that make up those big ones. I’m thankful for delicious food! I’m thankful for my friends and family and the time I get to spend with them. I’m grateful for my kind, sweet, supportive, and loving husband! My parents,home , and job. For God. I am grateful for the opportunity to see my grandmother this Thanksgiving. I’m thankful to have a life and job that allows me plenty of time to conduct lots of kitchen expiriments. I’m thankful for my children and for being able to live where I have a chance at my dreams coming true. I am thankful my father is my father. He’s a great man/dad/human. I’m thankful everyday for my family and a measure of his health. I am thankful for my husband and three children, as well as the never wavering support of the rest of our family. I’m very grateful for my adult children who have demonstrated time and time again their patience, understanding, persistence and generosity. They are more the person that I could have ever been and I thank the universe every day for bestowing them in my life. I am grateful to be staying put this Thanksgiving. I was in a very bad car crash 6 weeks ago. I am grateful I survived, and I am grateful my husband took such good care of me. I am thankful for the love of God, my husband, children, extended family and good friends! My life is full of blessings! I am grateful for my loving and wonderful family, and that I get to have a meal with all of them together using my newly renovated kitchen! Truly blessed. I’m grateful for God’s grace and mercy. I am grateful for a great many things, but today, I am grateful that my post-partum fog is lifting as my 14 month old is weened and mostly sleeping at night. It is incredible what a difference it makes in my energy and my mood to be rested and to keep all my calories. I am grateful for God’s grace and mercy that He pours out on my life through His Son, Jesus. I am grateful for my son and family. They are the cornerstone of my life! I’m thankful for my little dog. She brings so much joy into my life! I’m grateful for family…and especially for the fact that my three-month-old gets to meet his great-great-grandmother this Thanksgiving! I am thankful for the opportunity to be able to stay home with my 4 children and homeschooling the oldest 2 . I am grateful that my son and his wife are back in town. Since I moved back to my hometown a little over a year ago, I’ve been thankful to have this time to spend with my family and just exist in the same space together. I’m thankful for my family. I know that sounds cliche, but it’s true. I am thankful for my family and hopefully the completion of our adoption soon! I am grateful for my daughter’s continued good health after a health scare. Family & fried s top the list, but also the beautiful area we call home. I am thankful for a beautiful world full of everything we need. I am thankful for my children who teach me as much as I teach them. I am thankful that I live in the United States. This year, as always, I am most grateful for our wonderful neighbors. They keep a close eye on us and provide whatever assistance we need. In exchange, we get to be an extra set of grandparents for their children, something for which I am also grateful. We get to have chickens and dogs and cats! No bees, but perhaps this book would inspire us to get some? This year, being fraught with emotional turbulence from all ends of the spectrum, I am most thankful for a loving and supportive man who has served as my rock throughout every thrilling up and every soul wrenching down. Mostly, I am thankful that he is so committed that he was kind enough to ask me to marry him last week in the US Virgin Islands. The way that I feel, I think we may need a new term for thankful. I’m thankful for my husband of fifty years and that our daughter and her family will be here to share Thanksgiving with us. I am thankful this year that my brother is healthy. He went through a health scare earlier this year and is still working through some of the medical stuff but he will be ok. The doctor have cleared him of the scary stuff. For his health I am the most thankful. I’m thankful that I am finally healthy again after 8 months and can go horse back riding and running again. I’m thankful that my husband has outlived the doctors’ predictions, despite his heart condition. I’m also thankful for our two-year-old son. I’m grateful to be living in a home where I have a little front yard where I can watch the birds peck around. And that I get to share it with my husband. Also, coffee! I am grateful for the family dinners we have together–even if the are at 9 pm at night! I am thankful for my sister and her baby who had a big health scare earlier this year but are both with us for this thanksgiving!! I am thankful for health, family and the grace to be. I am very thankful for my parents and the love and care they have always shown me! I’m thankful for a wonderful support system of marvelous friends. I am thankful for my wonderful husband, who had worked so hard to get our house ready for our adoption home study! I am grateful for all of the abundance in my life. Blessed with much love, family, food, heat (it’s been chilly, yes?! ), home, clothes, books, and opportunities. I am grateful for a bountiful crop from our organic garden this year. I was able to can and freeze lots of produce. Thanks so much for all of your recipes and tips. I am blessed to have found your blog. I am thankful for family and friends, near and far, and especially for the fact that my daughter lives close enough to come home for the holidays. Love, love, love. I’m thankful for the life that I have: amazing friends, so much laughter, a job that I enjoy with smart and invested coworkers, a partner that loves me deeply, the freedom and space to do crafts and projects galore, and a dear trouble making cat. i am so grateful for my healthy son and loving family! I am thankful for my family, for colder weather, for a wonderful warm house to get in out of the cold, for yummy things from the oven, and for my friends. I am grateful for my health, my husband, our home. I am so thankful that my family is happy and healthy. This is my son’s first Thanksgiving and I’m so grateful to have my precious boy in our lives! grateful for my kiddo’s parents. I am thankful for my children. I am also thankful for my small flock of chickens – I have had chickens for a year now. I am also thankful for the canning help I have received this year – I am new and have just been canning for the past 2 years. Thankful for the opportunity to live a more homestead lifestyle in the last few years. I am thankful for the love of our savior and the family that he has blessed me with. I am thankful for a loving and caring family as well as friends. I am thankful for waking up each day and able to enjoy such wonderful beauty all around me! I am so thankful for both mine and my husbands family. We had a crazy whirlwind year and it was so much better because of the support and love we got from everyone. I am so grateful for my family! I am most thankful for the love of family and friends. What has been poured out over the years has come back, pressed down, shaken together, and overflowing in good measure! I am grateful for so many things in my life! I am blessed with two kids and three grandkids–two of which will help Grandma pick fruit. : ) I am blessed with a great job. I wish I had more time to do the things I want to do but grateful for the time I do have. Greatful for my family and am looking forward to seeing them all, this holiday season. Even though I have to work Thanksgiving I am grateful I have a job! I am thankful for my husband who puts up with me and that I will be retiring in 3 years and 6 months after my 5th daughter goes to college so I can live in the mountains and learn to make my own food. I am grateful for my loving,caring and hot husband and my children and the grands! My life is so blessed! I’m grateful for living a life I love and loving the life I live. I’m thankful for my parents help and support with my own children. Grandparents are the best! These books look like a lovely collections…I have them wishlisted on Amazon.com. As a federal employee, I am thankful I survived the year without any financial catastrophe’s as Congress has booby trapped the playing field for folks like me. That being said, I am also thankful I started canning when I did this year, or no one would be getting a thing from me for Xmas. Am pairing up my many jars with chips and cheeses, sausages, hot cocoa and on and on and I have had a lot of fun doing all this too. I’m thankful for family and a community of like-minded people from whom I can learn! I am thankful for my 3 wonderful kids and my amazing husband who encourage me and support me in my homesteading adventures. The fact that I have enough space for chickens, and bee’s ( tho the box is not populated yet), and a large enough garden to feed my family. I would love to win as I am just learning. Im thankful for my family and our life together. I am thankful for a wonderful family and close friends — and a lovely day to spend with them! I am thankful that I have great family and friends. Life would be meaningless without them. I am so grateful to have gotten a new job that allows me to move closer to people I love. I’m grateful for my amazing husband and his family. They saved me from some hard times. Thanks for the chance! So thankful that everyone I love is happy and healthy this holiday! I am thankful for my health and family! And the brand new fulltime job that I start next Tuesday! I’m thankful for my husband and kids! This year I am thankful for the health of my family, the health of my marriage, and the relative stability of our finances. We feel so blessed every day. Thank you for the giveaway, and happy holidays! I’m grateful for all the wonderful recipes out there on the web! It’s so delightful to see what’s cookin’ around the blog world and to try new things with such ease. I am grateful for your website!! Very good format!! I am Grateful for the love of a wonderful man. I’m thankful I have food and shelter. I am thankful for my family and friends and their health. And I am always thankful for good food! I am thankful for my loving family and our beautiful nest. I am grateful for my family, particularly my loving and supportive husband. I am thankful for my family…immediate and extended. I am thankful for butter. and raw milk. I am for the opportunity to return to school for a career that I am passionate about even though it took me a while. I am Grateful for my family and for my first Grandchild that arrived this year! So very thankful for a kind, compassionate husband and three awesome kids! I am grateful for my family. Even though we live 4000 miles apart, we still are strong and close. I’m thankful for my adorable doggy! I am grateful for a job that allows me some wiggle room to spend time with family on the holidays before having to go to work. I am thankful for my little family- my partner and my pup all crammed into our little SF apartment! Family! Friends at home and work! I am thankful that my family is happy and healthy. GOOD DAY! HAPPY THANKSGIVING! TO ALL!! I AM THANK FULL FOR MY MOTHER,AND MY TWO BROTHERS! I AM THANKFULL FOR LIVING IN THE USA!!!!!!!!!!!!!!! AND THANK FULL FOR BEING ALIVE AFTER THREE YRS IN AFGANISTAN!!!! AND MOST OF ALL I AM THANKFUL FOR A GOOD LIFE. GOD BLESS EVERY ONE!!!!!!!!!!!!!!! I am thankful for so much but particularly that I have clean drinkable water, food in the fridge & pantry and that no bombs are dropping on my neighbrhood. Many in this world have none of these and I have all of th3m. I’m thankful to have moved into a new house this year that has room for chickens! These books would be a great inspiration and resource for our planning! I love Ashley’s books! It would be nice to have the set. I am thankful for my beautiful new house and new job that supports me. I am thankful for my family and my puppies. My dad has been losing his vision over about 6 months now. We of course immediately jumped to “tumor” and “aneurysm” and “stroke”. So far, the doctors aren’t seeing any of that, though there are a few more tests to run in that area. We had thanksgiving dinner at his place a week or so ago. My husband and my dad got to talking. By the end of dinner, we were pretty sure we know what’s going on with him now. We think my dad’s got myasthenia gravis, which my husband has had since his late teens. It’s not a barrel of monkeys of fun, but it’s totally treatable and totally manageable. And there’s a super-simple test they do to conclusively diagnose it (instead of a diagnosis by “well, it’s not *that*, and it doesn’t seem to be *that*”). My dad’s still got a while before he can see his next doctor, and we definitely want to absolutely rule out tumors and aneurysms and strokes. But now he can ask specifically for this test and hopefully push it along a little. I’m grateful my husband is aware of and responsible enough to take care of himself with this disease. I’m grateful my husband and my dad get along well enough to have conversations like this. I’m grateful that there are survivable options, given my dad’s collection of symptoms. I’m grateful that my dad has decent enough health insurance in his retirement to get this checked out. I am thankful for the big picture. I am grateful that my entire family is happy, healthy and able to celebrate Thanksgiving, no matter where we all live. I am most thankful for my family. I’m also thankful that although I have to work two jobs and a lot of hours to make ends meet, I really enjoy both of them. I’m grateful for a new job with smart people, and an 8-year-old daughter who _wants_ to be an amateur apiarist! I am grateful to live in a country where there is opportunity, that there are kind people out in the world, that I have wonderful friends, and that both my family and my in-laws are supportive and loving. As I hear of friends getting diagnosed with cancer, I am above all grateful for my health. And if I can help it along by eating well most of the time, growing some food in the garden and doing some canning, even better. We’ve gotten into making a feta-like cheese, and one day there might be chickens in the yard. I’m thankful that I got to spend the day with my extended family for the first time in 3 years. Thank you for a lovely giveaway. I am grateful for my amazing husband! I am grateful for having my newlywed husband in my life. We got married less than two weeks ago, and I feel so lucky and thankful to have him and to spend Thanksgiving together. I am grateful that even though we are not where we planned, we are together, we are a family. They are amazing! I sincerely appreciate my wife and her cooking ability which is always evolving. My mom is cooking as I write this. She is the most adventuresome cook I know, the original self taught chef. I am grateful for having pretty good health. At 62 I believe every day now is a gift from the heavens. I am thankful for spending time with family and a beautiful Portland day. Happy Thanksgiving! I am grateful for my surprise baby girl this year! She has brought so much joy to our family! It’s a hard year to be grateful, but I’m trying. I’m grateful for the 5 days I had with my son, and extremely grateful for friends and family that have been loving and constant tethers in a storm of overwhelming-at-times grief. And for my husband who has been my rock while he also mourns the loss of our baby boy. In law enforcement, I see people and families in some of their worst moments in their lives, especially during the holidays. I am thankful most for the husband who is my rock when I come home and need to feel the emotions of the day because I had to be the rock for a grieving stranger. My husband, who lowers my blood pressure and helps me find my inner peace. My husband, who is kind, gentle, and soft spoken. I am grateful for the health and happiness of my family! I’m thankful for a healthy happy family and my new job! I am thankful for my husband and my two beautiful girls! I’m thankful for so much, my husband and daughters, and that my life is filled with everything I need today. I’m thankful for family, friends, and the canines that live allow me to live in my house. I am grateful for knit sweaters and indoor plumbing! I’m thankful for good health, an amazingly loving husband, and my 4 beautiful children… And a ton of other things!!!!!! I am thankful that my husband is still here. He has leukemia and he was very sick last year. This year, he is doing much better. I am grateful for my family, especially my wonderful husband. I’m grateful for my family and friends. November has been a very difficult month for my boyfriend and me, and the support from our loved ones really helped us keep going. I’m grateful for my family around me and reliving the tastes of summer berry picking with things we’ve canned returning for holiday eating and giving. i’m grateful for time spent home, family traveling for visits and their safety to and from. my kids, friends & wonderfully supportive family! I’m so very grateful for my sweet, sweet husband. I am thankful for the lovely company of my three grandchildren. My family, who not only take me in for Thanksgiving, but are ready and willing at the last minute to have me arrive a day early (which is a big imposition). I am thankful for the few hours that I get to spend with my extended family! Especially grateful for family this year – lots of ups and downs but we’ve been so, so there for each other. Happy Thanksgiving! I’m grateful for my husband, my family, and the humble roof over our heads. I’m grateful the increasing access to DIY knowledge like this!!!! Thankful for family and friends and God’s hand in our lives! Thankful for my beautiful & healthy children & a husband who loves me. I am greatful for all the love I have in my life and for being able to enjoy simple pleasures, like my cat purring on my ankle right now. I am so thankful for my husband, our new home, and how incredibly lucky we are to be in a better financial situation then we were this time last year. I am thankful for an outrageously amazing community – lots of love, laughs, and good times. I’m thankful to have spent a Thanksgiving with dear friends enjoying good company and food! Deeply grateful to be alive! I’m thankful for my wife, my kitties, being able to support us & have all we need, and my family. I’m thankful for my amazing kids, beautiful wife, and the opportunity to play banjo with such superlative musicians. And good food, great wine, my emotional, physical, intellectual and spiritual self. I’m grateful for my family and friends especially my brand new niece, Brooke Ashley Swenson. I am super thankful for the Lord and His love. I am thankful for family, friends, and my felines who all encourage and love me! I am grateful for many things, but right now I am most grateful for my sister without whom I would never have been able to prepare for the 30 person Thanksgiving gathering of my in-laws! I am so thankful for the love in my life and getting to marry the love of my life this year! I am so grateful for my husband and my family. warm socks… the ability to make my own choices…and french fries with friends. I am grateful to our armed service members who spend so many holidays away from their families on our behalf. I’m thankful for my little farm and my boys who have come back to grow produce for farmers markets. I am grateful for my husband’s enthusiasm for my homemade meals, whether they are thrown together experiments or well thought out feasts. I am grateful for my best friend jack-of-all-trades husband of 33 years and our 2 wonderful adult children. I have a warm house, plenty of food in the larder, and a life that is incredibly satisfying. We try to grow, hunt, brew, ferment, dry and can almost all our food. I am beyond grateful I was able to care for my mom the past three years before she lost her battle with cancer. I am grateful we laughed through it all and she was home, in her own bed and smiled to the end. I am grateful for my 2 wonderful daughters and my wonderful husband as well as our family back east and our friends that are like family where we live. Each and everyone holds a special place in my heart and has an impact on who I am. Love my food in jars book and looking to add to my collection! Thank you for this giveaway! I am thankful for the ability to be thankful. So many people go through life without even realizing what they have. I am blessed to have been raised with feelings of gratitude and happiness with the precious present. I’m thankful for a quiet and sedate Thanksgiving this year, and a minimal amount of drama, and a lot of amazing food that everyone came together and brought for the occasion. I am so glad AND thankful that I have a wonderful family and we can enjoy life and living simple. We make due on very little but enjoy every moment together! I am super thankful for my health, friends and family this year! I am super thankful for my health, friends and family! I am thankful for wonderful family, friends and work friends. I’m thankful that the deer that jumped out in front of my husband’s car didn’t cause him any serious injury, and was able to be used to fill our freezer. I’m thankful for this week off from work! I’m grateful for my husband, my brain, my good health and our new home and all the new memories we’re making here.